When I first saw Millème, my reaction was "Qu'est-ce que c'est?" I didn't expect to see such a pretty place on this busy street. 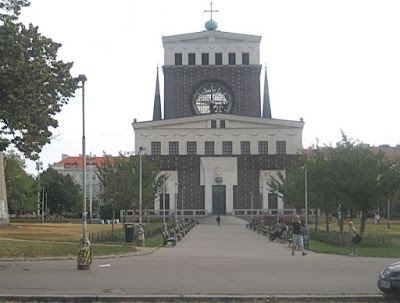 The eye-catching French café is close to the Jiřího z Poděbrad metro station, just across from The Church of the Most Sacred Heart of Our Lord. So you'll always know what time it is. I went through the doors and saw that Millème was pretty on the inside, too. 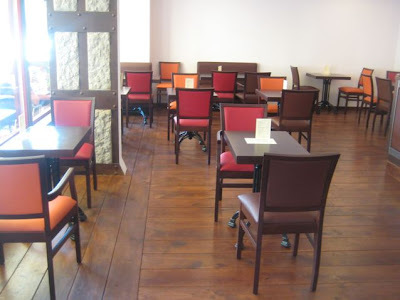 There was simple, colorful furniture, dark wood flooring, and plenty of light. The walls did look bare, though. 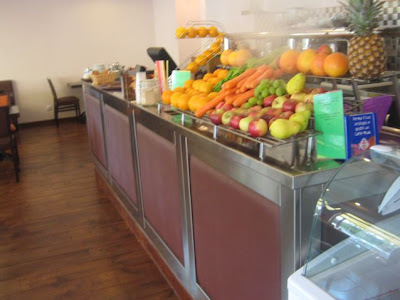 There was a beautiful spread of fruit and vegetables under a water mister. They make regular fruit or veggie smoothies for 80 CZK. The ones made with "exotic" fruit cost 120 CZK. On my first visit, I got a bunch of stuff to take away. The first treat that caught my eye was the raspberry tart (95 CZK). This was rather exotic. The receipt called it a "Shogun." 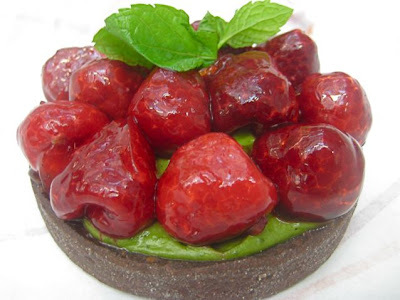 The berries sat on a green tea cream, held by a chocolate nut crust. The glazed fruit was, fresh, tart, and sweet, and I really liked the cookie-like base. I was amazed how assertive the green tea flavor was. I appreciated how unusual it was. However, it might not appeal to everyone. For a second sweet, I went for the straight-up chocolate tart (66 CZK). 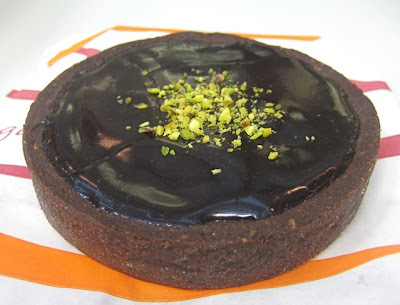 The rich, intense chocolate filled the same tasty crust as the raspberry version. But it was not quite as good as the chocolate tart at Millème's closest competition, Paul at Palác Flóra. 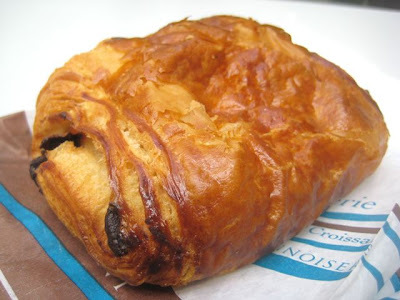 I also got a pain au chocolat (28 CZK). Very buttery and nice chocolate. I'd say this was as good or better than the one at Paul. However, that one was only 19 CZK. 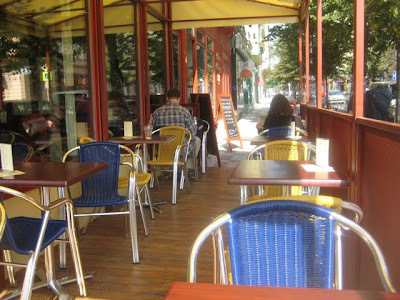 The ones at the pâtisserie, Café St. Tropez, can also be great. They use high-grade Valrhona chocolate, but I don't recall the price. I went back another time and sat outside on a weekened morning to enjoy the last of the warm summer weather. 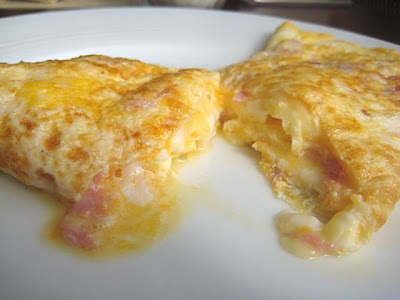 For my breakfast, I ordered a ham and cheese omelet (75 CZK). It was mostly unremarkable. 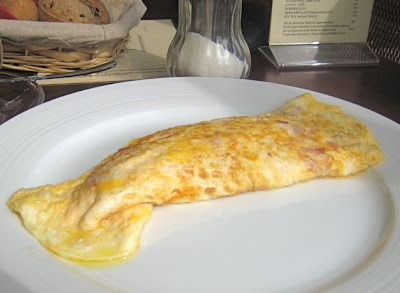 I liked that omelet was on the runny side. Neither the ham nor the cheese had too much flavor. Uncouth savage that I am, I asked if they had some ketchup. I wasn't surprised that this very French place only had mustard. It needed salt and pepper. It did look lonely on the plate, without any bread or other side items. 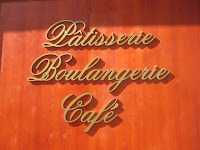 A French breakfast was also available (120 CZK). That comes with coffee, tea, or hot chocolate, orange juice, a croissant or pain au chocolat, half a baguette, butter, and jam. There were also several types of quiche available (89 CZK). They also had salads: Caprese(129 CZK), Niçoise (159 CZK), grilled chicken (179 CZK) and goat cheese (189 CZK). Simple sandwiches were available (69-99 CZK). I was intrigued when I saw the menu mentioned fresh iced tea (39 CZK). It came in a frosted glass that formed some slush in the tea, but there were no actual ice cubes. 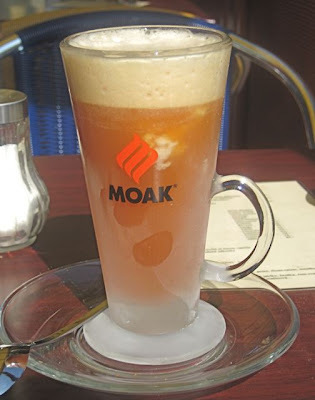 There was tea foam at the top, something I'd never seen before. It was OK with some sugar, but I should have asked for a lemon slice. It wasn't bad, but given it's small size, I didn't think it was worth the money. I sat and read a book for a while in the sun. Then, I decided that a dessert to go with my breakfast would not be inappropriate. 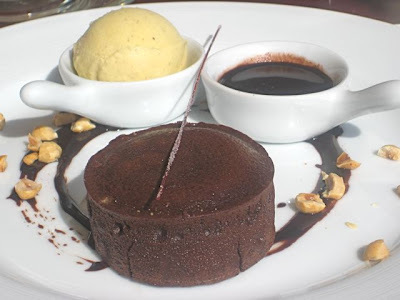 I ordered the Moelleux chocolat with vanilla ice cream (98 CZK). The warm, perfectly formed cake also came with a dish of chocolate sauce. The cake, with its liquid chocolate center was good, though not the best I've had. I didn't particularly like the vanilla ice cream, but the sauce helped. The cake's shape was so perfect, the interior so consistent, I wondered if it was baked fresh on the premises. But given the beauty of some of their other offerings, I though it very possible it was. 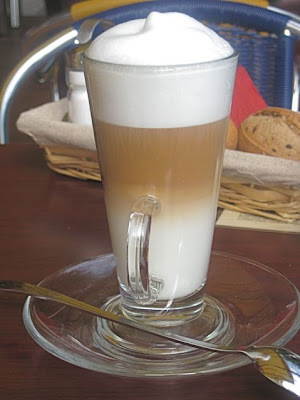 To go with my cake, I got a decaf cafe latte (49 CZK). It was nice to look at, great foam, and tasted just fine, but the latte was only warm, not hot, on arrival. Perhaps the milk was not heated properly. I'm glad to see the continuing renaissance of food and drink options in this part of Prague. I'd like to try a few other things at Millème, but it is hard to imagine anything will outshine their cakes, pastries, and other desserts. I do wish they'd expand their breakfast menu. My humble suggestion would be to offer that simple, lovely creation the French call pain perdu. That's a breakfast I'd have anytime. But I'd still call it French toast. I have to add something to this post. 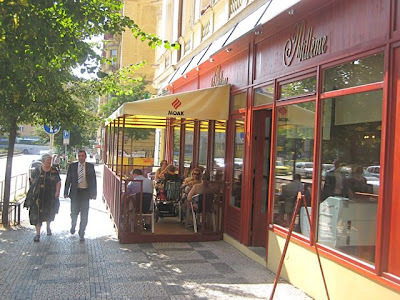 After I published it, V went to Millème and had a very bad service experience. The waiter got first her juice order and then her omelet order wrong, kept her waiting more than 20 minutes for it to be fixed, even though the cafe was empty, and was unapologetic and rude when she complained. I hope this is not an ongoing problem. So tempting !. Will have to go down Vinohrody, when I come back to Praha in Feb, 2010. I love Raspberry,s, not sure I would like the green Tea cream though. Another good outlet down Vinohrody though.